The HTC Vive and Valve's SteamVR make for one of the more compelling virtual reality experiences, mixing in real-world motion tracking with the immersive headset. But third-party manufacturers couldn't tap into the Vive's full potential and make creative new peripherals—until now. Currently, it consists of three key components. The base station - the beacons known as Lighthouses in the Vive setup - comes in pairs for 360-degree coverage, beaming out lasers to the tracking sensors. Up to 32 sensors can be put on a single object, and they wirelessly communicate with the third part, the host. "For now, this means a PC" Valve says, though the door is open for more integrated alternatives in the future. 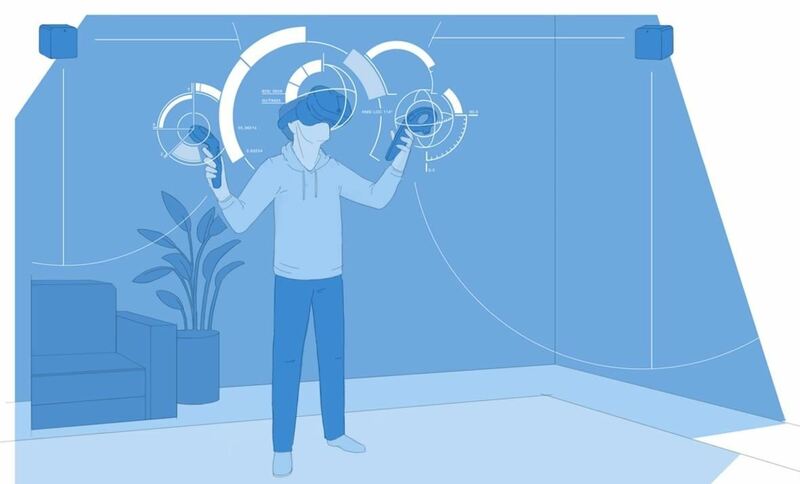 Either way, that takes 3D positional information from the sensors and the base stations, and uses the SteamVR API for timing, sync, and prediction. A quick visualization of how Lighthouses calculate positions in a room. Initially, this will lead to third-party manufacturers creating new and interesting controllers for the Vive. In some cases, they could be title-specific (e.g., a steering wheel for a racing game or a sword for an RPG). Down the road, room-based positioning data could lead to greater innovations that involve tracking both objects and gamers in the designated play space. While the SteamVR Tracking API is royalty-free license, at least one member from a development team will have to attend a SteamVR Tracking Training course for about $3,000 in order to get the license. More information on the class and license can be found on Steam's community website. The SteamVR Tracking API primarily serves the HTC Vive, but in the future, it could offer developers a simple way to support these features on additional headsets. We likely won't see much come of this in the immediate future, but next year we should see an expansion of what the Vive—and future VR headsets—can do.